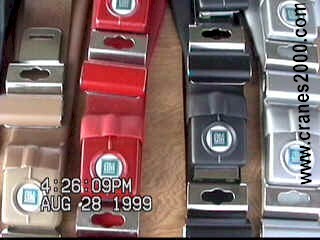 1959-62 RED or Black ON RIGHT-available all colors-red black sale $575 pair -car set. 1963 ic-5000 buckles rechromed, polished tops, $650 complete -restored with anchors. 1963-LATE AND 1964-65 $550 pair = 1 car set SADDLE. not pictured 1964-65 ic-8000 buckles rechromed---new webbing remanufactured --all colors -- retractors, sale $550 pair w/retractors + pockets extra. 1965 & 1966 EARLY sale $595 pair w/retractors + pockets extra. 1969 shoulder belts black - restored $595/ pair in stock. 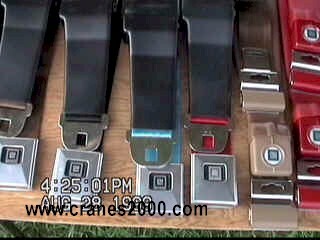 69 lap belts - all colors- $645 pair -- stainless buckles with boots.